How do I manage a Parallels Desktop for Mac Business Edition license? The Parallels Licensing Portal allows you to manage a license key for Parallels Desktop Business Edition. If you have not created a business account yet, please see KB 122801 for instructions. To start managing a Parallels Desktop Business Edition license, you should first register it. Note: If you participate in several business accounts, switch to the correct account before registering a license. Go to Dashboard, select Manage business accounts, and make sure that the Active account tag is on the account you'd like to register the license under. 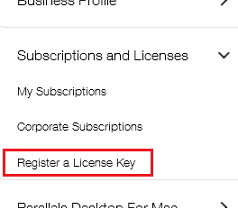 Expand the Subscription and Licenses menu, and click on Register a License Key. Enter your license, and click the Register button to register it. To view information on the registered license, go to Parallels Desktop for Mac > Corporate Computers. At the top of this page, you will see the license key, the number of activations it supports, how many of the activations are in use, how many remain, the license allocation type, and the license expiration date. At the bottom, you will find information on the devices the license was activated on, including the hostname, serial number, MAC address, IP, etc. You can select the data to be displayed using the Show/Hide Columns dropdown menu. Check the checkbox next to the license you want to view information for. To manage the license on a certain device, check the device in question. Then click on Actions. This option exports all the information about current activations of the license in the format of a CSV file. You can either save it on your computer or open and view it right away. This option prevents the license key from being used on the selected device. Until you remove the device from the blacklist, the license will always be rejected on it, even if it has available activations. This option removes the license key from a device and thus releases an activation, which can be used on another computer. It is required if a certain device is replaced with a new one, for example. Go to Parallels Desktop for Mac > Corporate Computers, and click on View Blacklisted Computers at the top of the page to view the list of devices added to the blacklist. In order to remove a computer from this list, mark it with a tick, click Actions, and select Remove from the blacklist.